Frigate birds on 'Man of War Birds' are sea birds of the family Fregatidae. They are pellagic fish eaters, that hunt their food on the wing. They often resort to piracy, stealng food from the more efficient hunters such as terns, and this behaviour also gives them the nickname of 'Piratebird'. 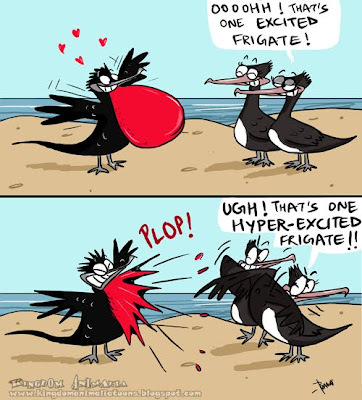 The duration of parental care in frigatebirds is known to be the longest for any bird! Frigatebirds also have the largest wingspan to body ratio for any bird! For this reason, they are unable to walk or swim, and prefer to stay aloft, often doing so for more than a week! Male Frigatebirds inflate their red gular pouches to attract females during the breeding season.